Vir Das Family Wife Son Daughter Father Mother Marriage Photos Biography Profile. Vir Das was born in Dehradun. He grew up in Africa and studied at the Indian Language School in Lagos, Nigeria, as well as at the Lawrence School, Sanawar and Delhi. He earned a bachelor's degree from Knox College, Illinois in economics and theater with a concentration in performance. Das is also a brother of Knox's Delta Theta chapter of the Sigma Nu fraternity. After graduating from Knox, Das was accepted into the Stanislavski program of the Moscow Arts Theater.He married his five-year-old girlfriend Shivani Mathur in October 2014. It was Knox that Das first explored the stand-up comedy with his first (1-1 / 2 hour) special, Brown Men Can not Hump, which debuted in the Knox Theater in Harbach. He received a Richter Scholarship for Theater and then won the Colton Outstanding Performance Award from Knox. He was teaching assistant for Beginning Acting at Knox. At Harvard, Das trained as a model actor for six months and played eight plays at the Moscow Arts Theater. Das returned to India in April 2003 and has since presented more than 100 comedies in all major cities. He debuted six comedy specials written, directed and starring at the India Habitat Center. These include brown men can not bump, not for members only, bored of things !, that lets out the DAS ?, son of a switch! and VIRagra. Das began his television career by hosting two TV shows on Zoom. The first was the Ki Sabhin Line in Maast Hain where he was an uncle of agony. The second was his own stand-up comedy, Ek Rahin Vir. Das also hosted Top Drive - Getaway for Star World. Das has appeared on a variety of comic television programs. 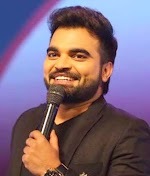 He hosted Cricket Firsts, a sports comedy about Zee Sports (now TEN Action +). He did comedy improvisation on Lo Kar Lo Baat of SAB TV. He was an addition to the cast of The Great Indian Comedy Show on STAR One. We can see him anchoring Now Not Showing on CNN-IBN. Das is the host of News on the Loose, his own comedy show on CNBC-TV18. News on the Loose received its own half-hour weekly program News On The Loose - Weekend on CNBC-TV18. Das was cast as comic relief in the curse of the tomb of King Tut Tut, a Hallmark mini-series filmed in India. He began shooting for his first two roles in Bollywood in early 2006. He played a small role in Vipul Shah's Namastey London in 2007. Das has performed in approximately 35 plays, over 100 humorous shows, eight television shows, two films and six special comedies. He has written comic columns for Femina, Maxim, Exotica, DNA and Tehelka.